Most people tend to associate observing the weather as a daytime activity. The darkness of the night tends to draw most people indoors. The weather, however, is still as active during the night as it is during the day. 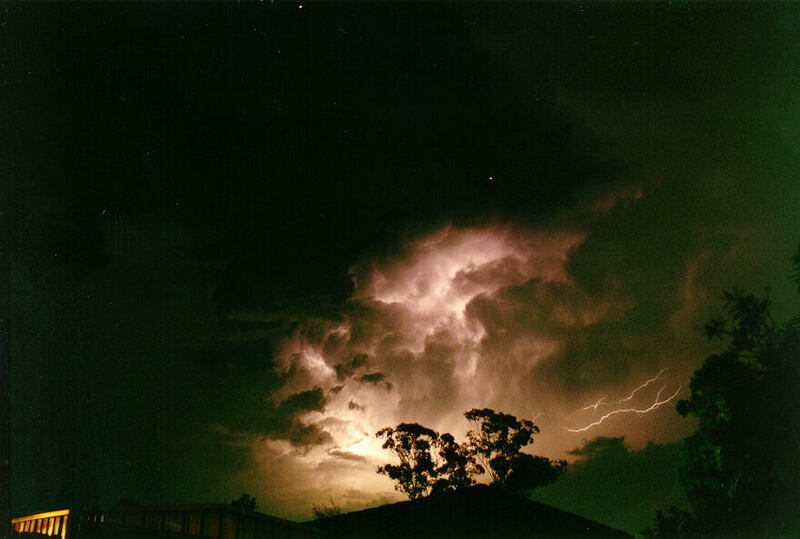 Some significant weather situations such as rain, thunderstorms, and wind can and do occur during the night. In particular, the conditions associated with cold weather such as snow, frosts, and fogs are more likely to occur during the night. Night weather conditions therefore influence everyone in one way or another. Cold conditions require heating indoors. Thunderstorms occurring the night can cause blackouts. On the other hand, there are those people that work during the night in shifts. They are more directly influenced by the external night weather conditions. For instance, travelling during the night introduces reduced visibility. Flooded creeks or large puddles can be difficult to see. This section covers briefly many observations that can be made during the night using various techniques. Night observations require a variety of special techniques. Although it is dark, it is still possible to observe sound as well as light illuminated images. And, of course, the night does not hamper observations of the various weather conditions that we can feel during the night such as temperature and humidity. The most effective weather observations at night still require some source of light to illuminate the various features in the sky. Such light sources include any of the following: lightning, city or town lighting (on a large scale), street lighting (on a local scale), back ground light from the moon and stars, and automobile headlights (on a local scale). Such weather observation techniques require a lot of daytime weather experience and a previous knowledge of weather features such as cloud structure and cloud types. Those that have hearing impairments rely on sight and feeling when observing the weather and obviously must view weather differently to the rest of the population. Sound observations are also effective observation techniques. In fact, it is normal for sounds associated with weather to be more audible during the night due to the lack of daytime noise such as those associated with traffic. Again, experience is needed to observe certain sounds during the night especially since we tend to observe noise simultaneously with other observations. Those who are visually impaired rely on sound observations and feeling both during the day and night. They will obviously have a different view of the weather and may never be able to appreciate weather from the view of the rest of the population. They way we perceive (like or dislike) certain weather conditions is definitely influenced by the impact the weather has on our bodies. For instance, most people seem to wake up in a good mood if they can view the sunrise. In other circumstances, high humidity makes people feel uncomfortable. Nevertheless, despite how weather makes people feel, feeling the weather is a form of observation and it is as important during the night as it is during the day. Such observations include feeling temperature, humidity, rain, wind, dust, and vibrations associated with thunder. It can even include feeling static electrical discharges especially during dry weather! Of course, the most common form of night time observations are those linked to thunderstorms: namely lightning and thunder. However, it is not as obvious as it may seem. Lightning and thunder activity reveal an abundance of information about thunderstorms including location, severity, precipitation cascades, types of precipitation, speed and direction of the storm's movement, evidence of wind, cloud structure and the extent thunderstorm activity. Structure is the most important observation to note from lightning effects of thunderstorms. Internal lightning activity such as sheet lightning can reveal the shape of the thunderstorm cloud structure. Lightning can reveal precipitation intensities, base structures such as shelf clouds, the extent of the front, side and rear anvils, and the downdraughts from the storm as revealed by wind blown precipitation. For those who believe in light green tinges, I have noted night time hailstorms to reveal greenish effect due to the lightning. In normal cases, lightning will appear pinkish. The difference in structure of hailstorms must have an impact on various light frequencies such that green dominates. I don't really have an explanation but definitely, I have observed several times green during hailstorms. Another type of observation is thunder. The distance to thunderstorm can be determined and calculated (approximately) by measuring the time from the occurrence of lightning and until when the associated thunder is heard. It must be the associated thunder and not just any thunder heard. Once the time is measured, multiply this by 340 and the answer will be in metres. 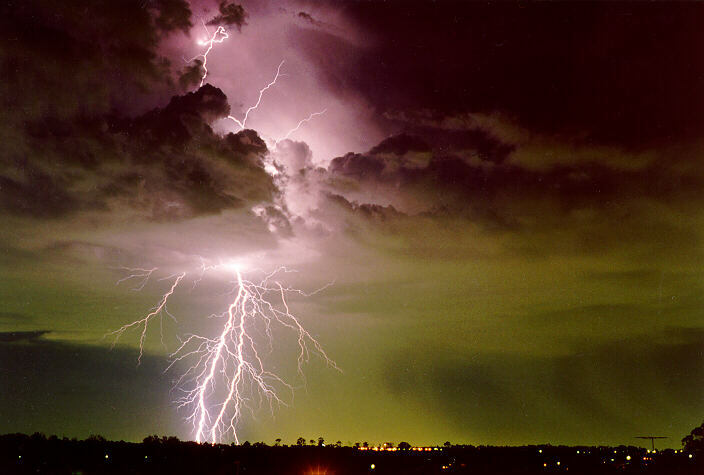 For instance, a 10 sec lag between lightning and thunder is about 3400 metres or about 3.4 kilometres. The fact that thunder is heard means it is nearby up to a distance of up to 20 kilometres or so. This depends on the severity of lightning. Just being aware of lightning means you may expect thunder and therefore you are not startled. The following observations are only discussed briefly. The observer is more or less made aware of the surroundings. Cloud movement canm be determined using city lights, or the moon if partly visible. Also brighter stars, if visible, can help determine direction and speed of cloud movement and also the fact that there are breaks in the cloud. This therefore sometimes reveals the types of clouds, particularly if the type of cloud was known during the day. The only ways to observe distant precipitation during the night is to use city lights. 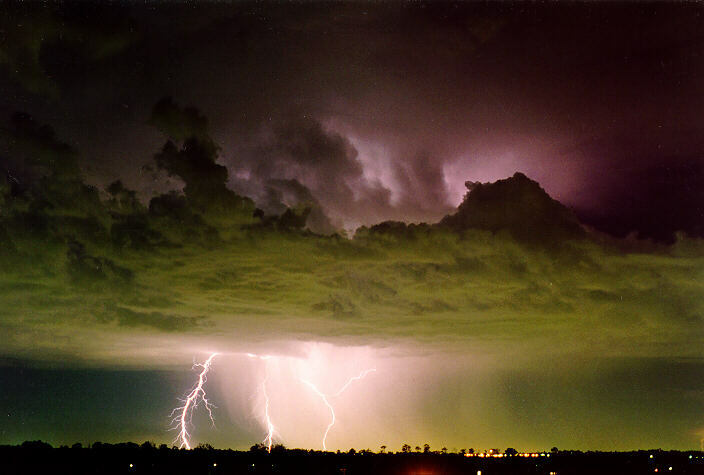 During thunderstorms, lightning sometimes illuminates precipitation cascades. City lights can also illuminate them. Observing precipitation locally including hail requires hearing. However, by switching on exterior lights, precipitation will be observed through its reflections. Frosts, dew, fogs and mist can be observed during the night. Frosts and dew can be observed particularly on objects like cars. In the early ours of the morning, you can feel moisture or the ice crystals with your finger sliding on the panel surfaces. Fogs and mist can be observed due to the lack of visibility and the reflection of the headlights of the car. It is difficult to distinguish between mist and fog except mist occurs when it is raining or has been raining. Mist is also more patchy. Nevertheless, both cause problems with visibility and therefore should require extreme caution. Fog and mist can also be observed with moonlight. Fog above causes a halo. I have taken the opportunity after a dusty day to observe the dust haze into the night with the aid of moonlight. Other hazes in lower parts of the atmosphere will be more difficult or near impossible to observe. There is no difference in the methods of observing temperature and humidity during the night as compared to daytime. The main difference is the pattern of temperature and humidity changes. Humidity will tend to rise and temperature will fall. The only difference in making wind observations at night is the visual observations. Noting swaying of trees will require some light at least in the background to cause a shadow effect. However, the sound made by wind on trees and other objects is more noticeable during the night because there is a lack of other interfering noises such as traffic. Because of the dangers of the aftermath of severe weather events such as downed live power lines, it is important to note if severe weather has occurred observed during the night. The most important thing to note here is if there were thunderstorms earlier or during the evening. For instance, there have been cases people make a particular journey in dry conditions. In the meanwhile, a severe storm with flash flooding passes through. On the way back, bridges may have been flooded or even wiped away! In some areas such as Sydney, there are gates that block traffic as a warning of flooding. But still, it is important to be aware of any unusual observations. It may save your life just by being careful. Because of the light created by bushfires, they are easily observed during the night. But in rugged terrain, it may be difficult to observe until you get close. Be alert during times of dry conditions and high bushfire danger levels especially when travelling through forested regions.